HomeSomething old or something new? The social investment market is characterised by new organisations, new programmes, new models of financing, and new cohorts of service users. There is great value in demonstrating the social return of something new, but the risks associated are inherently greater. Investors may therefore require a higher financial return. Investors in innovation often receive valuable media attention, as new programmes are more newsworthy. Some social programmes have been robustly evaluated as to their effect. These evaluations can cover applications of the programme in different places and to different intervention groups. The culture of developing, defining and trade-marking a social programme such that it has training and resources and can be delivered across contexts is more apparent in the US. With these types of programmes, investors are likely to perceive less risk, as they have data relating to previous effect sizes and the proportion of programmes that achieved them. They also have the organisation that developed the programme providing training, resources and support to the service providers. The words ‘evidence’ and ‘innovation’ are both commonly used by all parties when justifying involvement in a social impact bond (SIB). In all SIBs, there is likely to be innovation around the partnerships that are formed, the way services are delivered and the people services are delivered to, and the basis on which Government pays – outcomes, There is also likely to be more evidence gathered about the outcomes of a programme than has previously been collected or made publicly available. SIBs are paid for on an outcomes basis, which means that service delivery organisations are free as to how services are delivered. But this is not always the case. The Peterborough SIB collects performance management data and uses this to improve its services as the SIB progresses. Contracts are renegotiated with service providers annually and changed to better deliver the outcome of reduced reoffending. The NY City SIB for young offenders on Rikers Island is developing a new programme, but its primary component is Moral Reconation Therapy, a model of Cognitive Behavioural Therapy, that has been well researched and has an evidence base. The Essex SIB will deliver Multi-Systemic Therapy and Manchester City Council is looking to provide Multi-dimensional Treatment Foster Care. These programmes also have an evidence base. So can you have a greater impact if your SIB delivers a programme that is already well-evidenced or can you have a greater impact if your SIB delivers something completely new? In The Good Investor, Hornsby and Blumberg (2013) argue that potential social return is greater for programmes that have yet to establish an evidence base. “Investments that lie on the higher sections of the curve are likely to be increasingly characterised by less well tested, less evidenced approaches, but which are innovative, and present the potential for high levels of impact generation (e.g. through effecting a game-change in the prevailing dynamics). Investments that lie on the lower sections of the curve are more likely to be in established approaches and fields of operation, where investors know more what they are going to get, but the impact that stands to be generated is comparatively modest”. 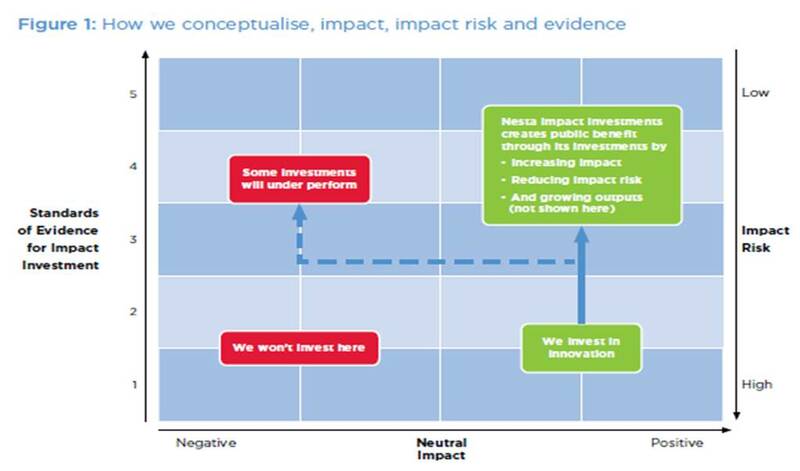 NESTA conceptualises the impact objectives of its funds in its report Standards of Evidence for Impact Investing using the diagram below. 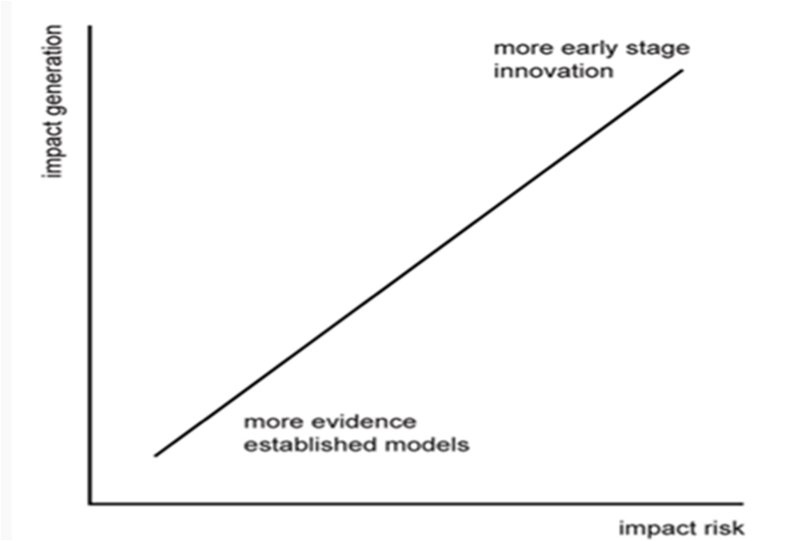 They aim to invest in early-stage innovations where both impact risk and potential impact is high, and then reduce impact risk as they scale effective programmes by increasing available evidence (Puttick and Ludlow, 2012, p.7). It should be noted that well-evidenced programs are not spread evenly across areas of social need, thus reliance on evidence – or programme outcomes that are easily or cheaply evidenced – could create a bias towards investment in certain social issues. “SIBs are a tool to scale proven social interventions. SIBs could fill a critical void: other than market-based approaches, a structured and replicable model for scaling proven solutions has not existed previously. SIBs can give structure to the critical handoff between philanthropy (the risk capital of social innovation) and government (the scale-up capital of social innovation) to bring evidence-based interventions to more people. SIBs can do this by aligning incentives among a broad set of stakeholders and shifting financial risk away from government” (p.7). The McKinsey perspective may be reflective of a culture of evaluating and comparing social programmes in the US, such that it is possible to chose from a range of proven social interventions to bring to scale. The role of philanthropy as the ‘risk capital of social innovation’ may also apply more to the US than other jurisdictions. The cultural and political contexts of SIB development seem to be driving different assumptions concerning the impact of evidence-based versus innovation models. There may emerge an overwhelming conclusion as to which is the more attractive for a SIB model, but it may be more appropriate for each SIB to respond the objectives of its stakeholders. ← Can I SIB this?